Only 12 km south from the medieval walled city of Siena, Tenuta di Corsano is a timeless Tuscan Country Estate which will become your home from home for years to come. Available for rent all year round, on an estate of rolling vineyards and silver-leaved olive trees, this 17th Century farmhouse lies in the friendly hamlet of Ville di Corsano and consists of six lovingly-restored apartments. Your hosts, the wonderful Migone Family, are happy to assist with local knowledge during your holiday. Click on the button more info to be able to read more details about the property. This is a delightful spot, the traditional setting of the accommodation set off by the soothing, rural surroundings. Here you can relax by the large and spacious swimming pool (7x14 m), or the gardens, sipping Villa Migone's own wine and prosecco or sampling some of the local delicacies prepared by Liliana, who can also organize your dinners on request. 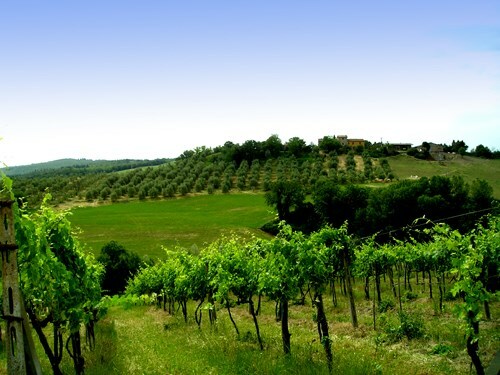 Tenuta di Corsano is a peaceful, stress-free country estate which produces the grapes for famed wines as well as olive oil, fruit and vegetables. For many guests the opportunity to relax by the pool, sit with a book under the shade of a fruit tree, or stroll through the grounds is all it takes to make a perfect vacation. The pretty hamlet of Ville Di Corsano (population 200) is a friendly little place with a small supermarket, a post office and a renowned restaurant, although Siena, the city of the famous Palio di Siena, can be reached in less than 20 minutes by car. The six apartments were recently renovated to include all modern appliances while maintaining the traditional Tuscan charm. The Tenuta's shared facilities include a garden, a barbecue and WI-FI in all apartments. QUICK RENT TENUTA DI CORSANO WHILST YOU CAN! "when I think of this place I become emotional. To find this place and to meet the owners has been a wonderful experience that my family and I will hold close to our hearts forever...."